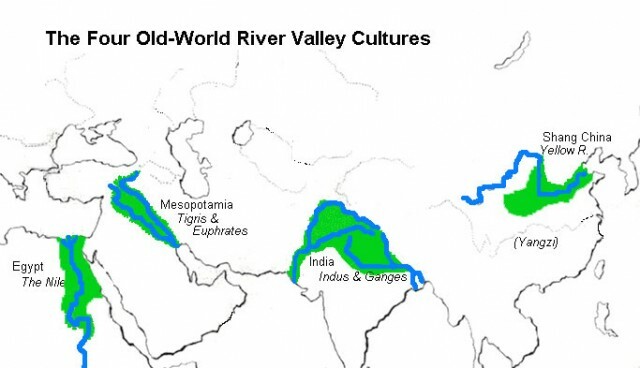 Early river valley civilizations arose in Mesopotamia, EGYPT, the INDUS RIVER Valley, and CHINA. Earlier agricultural societies (8,000 to 13,000 years ago) were largely subsistence cultures. The river civilizations had food enough to provide for classes of people other than just farmers. These societies all used agricultural surpluses to establish civilizations with cities and trade and to create greater sophistication in the arts, sciences, government, and even a leisure class. Cities enabled societies much more sophisticated than primitive agriculture allowed. The first beginnings of a higherlevel urban-rural society began in Mesopotamia about 4000 B.C.E. The other civilizations appeared shortly thereafter. Mesopotamia, “The Land Between Two Rivers,” lay in the valley of the Tigris and Euphrates rivers. The rivers provided fish and birds as sources of food. More important, they made agriculture relatively easy. The land lacked a dependable supply of rain, and the supply from the rivers was variable through the seasons. With careful irrigation, the water from the rivers allowed the fertile land of Mesopotamia to produce crops larger than the farmers needed to subsist. Cities do not produce primary products—they refine basic materials. Cities were vital for trade, handicraft production, government, and military defense. Sumerian civilization dominated Mesopotamia from 3500 B.C.E. to 2000 B.C.E. It was replaced by Babylonia, then Assyria. Sumerian city-states proliferated between 3200 and 2350 B.C.E., fominating their regions. Cities provided order and a mechanism for handling public projects. The cities collected the wealth of their outlying agricultural regions: barley, dates, wheat, vegetables, and livestock. City merchants traded textiles and other products for luxuries such as ivory from PERSIAN GULF peoples. Each city had its own god. The central structure in the fortified city was the temple to the city’s god and protector. Architectural highlights include the ziggurat, a large and aesthetically impressive temple tower and house of god made of mud brick, built as a form of worship. City administration was initially by assembly, but by 3000 B.C.E., kings ruled the city-states, the single head being more efficient when action was necessary. The king ruled over the city and its hinterlands, which received defense in return for agricultural products that allowed the kings to establish militaries, tax collectors, administrators, and the leisure class. Sumerians were the first to use bronze. They also made pottery and carved stones and shells while creating gold and silver jewelry. Sumerian pictographs evolved over the centuries into cuneiform. Sumer fell to the expansionist urges of Sargon of Akkad (2370–2315 B.C.E. ), whose empire lasted until circa 2100 B.C.E. Babylon was a successor to Sumer, dominating until around 1600 B.C.E. Babylon used Sumerian irrigation and agricultural technology and the Sumerian calendar. Babylon developed a number system based on six and worked with perfumes, cosmetics, medicine, and pharmacology. Hammurabi’s lex talionis was the first written code of laws. The civilization collapsed when the Hittites invaded around 1596 B.C.E. The third major city civilization, Assyria, was expansive. The Assyrians were immigrants who came in two waves, around 6000 B.C.E. and in 3000 B.C.E. They spread from the Tigris to the Armenian mountains in the north and the ZAGROS MOUNTAINS in the east, developing mining and forestry. Assyria established a few large cities for trade and crafts development, but it was mostly small villages with irrigated farms. Assyrians were organizers and warriors. The Mesopotamians early on lacked systematic laws, didn’t use analogy, and had limited science. But they had high-value literature, prime examples of which were the creation myth, Enuma Elish, and the epic, Gilgamesh. The Code of Hammurabi exemplifies the writing of law. Mesopotamia was deficient in stone and wood, which it had to import, but it had clay, which served for writing tablets as well as houses. The religions of Mesopotamia were polytheistic, with multitudes of temples to the multitudes of gods. The beliefs would later influence the Hebrew and Greek religions. Accomplishments of this civilization included the wheel, used in carts, the arch and the dome, cuneiform writing, astrology, and a number system based on 60. Mesopotamia was an indefensible and rich region without natural barriers—mountains and rivers—to keep out potential enemies. Many times in its history, a dynasty crumbled before the onslaught of a foreign invader. Dynasties lasted normally only a few hundred years. Although cities did slow the attackers because they were fortified and thus defendable, the cities were more important in providing the setting for the development of sophisticated societies with long-lasting cultural legacies. Egypt had but a single river, unlike Mesopotamia, but it was equally dependent on its flow. The NILE floods annually, restoring the fertility of the soil on its banks, the basis for Egyptian agriculture in a desert environment. Agricultural settlements appeared along the Nile around 4000 B.C.E. The towns flourished because they were protected from invaders by the RED and MEDITERRANEAN seas and the deserts. Egypt had only a few hundred thousand people in the Predynastic period, 5000–3000 B.C.E. By the Old Kingdom, c. 2575–2134 B.C.E., the population was 2 million, which grew to 7 million at the time of annexation by the Roman Empire. In 3100 B.C.E., Menes (Narmer) unified Egypt, establishing his capital at the new city of Memphis. From there he ruled a centralized state. He was pharaoh, or king of Egypt. The pharaohs built pyramids as symbols of their power and authority, in life and after. The pharaoh’s greatest power came during the Old Kingdom, and the greatest pyramids were built during this era. At Giza is the largest of the pyramids, that of Khufu (Cheops). The Egyptians were also polytheistic. Their principle god was Amon-Re, and they had a strong cult associated with Osiris. The cult believed in immortality, so logically they wanted their bodies to last forever, thus they developed mummification. The society was hierarchal, with the pharaoh as supreme head of society. There was also nobility, but the bureaucracy and military were more important. Other classes included priests, commoners, and slaves. Egyptians wrote in hieroglyphics on papyrus. They had skilled architects and engineers, doctors and mathematicians, and education was a path to being a scribe, a highly regarded job. Their calendar rested on observation of the movements of the stars and sun. The Egyptian economy was predominantly agricultural, depending on the Nile, which also provided fish and birds. Crops included emmer (wheat) and barley for bread and beer, as well as vegetables and fruits. Post-harvest fields provided forage for cattle, sheep, and other livestock, which provided meat and dairy products. Egyptian tools were simple—hoes, sickles, and the like, with plows drawn by cattle or oxen. Associated industries were wine and beer making, textiles, leather, pottery, baking, and woodworking. The exchange of goods and services was by barter because there was no monetary system. Taxation was heavy. Egypt also mined and worked metal—gold and copper. Their bronze age began around 1500 B.C.E., and iron smelting began around the 6th century B.C.E. Stoneworkers quarried and worked limestone, calcite, granite, and diorite using bronze tools. They also mined minerals and semiprecious stones. Because wood was scarce, Egypt traded emmer, gold, and other items for it. They traded with NUBIA and southwestern Asians in SYRIA, Mesopotamia, and Canaan. Alexander the Great conquered Egypt in 330 B.C.E., but his empire crumbled quickly after his death, with the Greek Egyptian Ptolemaic dynasty lasting until late first century B.C.E., when Cleopatra asked Rome into Egypt. The Indus River flows from a source in the HINDU KUSH and HIMALAYAS. It is unpredictable, like the Nile, and like the Nile, it deposits rich silt that keeps soil fertility high, allowing agriculture to thrive. The first crops cultivated in the Indus Valley were barley and wheat. This civilization also domesticated the chicken. Although Paleolithic communities had existed 200,000 years ago, and Neolithic communities from 8000 to 5000 B.C.E., complex society arose between 3000 and 2500 B.C.E. The Indus Valley civilization prospered on the river plains and vicinity in what is western INDIA and PAKISTAN. About 2600 B.C.E., the early cities began to interact, creating a common urban culture that lasted about 700 years. The inhabitants were known as the Harappan or Indus culture, and it thrived contemporaneously with those of Mesopotamia and Egypt. Each of the societies had its unique art, technology, and social arrangements because each developed from a different Neolithic community that existed in the area until around 6500 B.C.E. The civilization extended from the mountains of AFGHANISTAN and BALUCHISTAN to Gujarat, Makran, and Sindh on the coast. At its peak this civilization traded with the other cultures on the Arabian Gulf, peninsular India, and West and Central Asia. Two cities, Harappa and Mohenjo-daro, dominated. Each was fortified and supplied its citizens from a large granary. Having political and economic control, each was a seat of authority, a distribution site for the outlying region. The two cities may have served as cocapitals of the civilization. They did provide extensive development of the human aspect of the city—broad streets, marketplaces, temples, and diverse other public buildings. The civilization developed standardized weights and measures as well as standard brick sizes and styles of architecture. It had specialized labor in pottery tools and decorative objects. It also engaged in trade with Mesopotamia from 2300–1750 B.C.E. India traded copper, ivory, and pearls for Sumerian wool. Other trade was in metals—gold, silver, copper, lead. In Harappa, social status was shown by style of living, with clear differences between rich and poor. The religion was strongly based on fertility. The society began declining around 2000 B.C.E. because of deforestation, erosion of topsoil, and a general ecological decline that reduced the agricultural surplus, bringing on a problem of subsistence within the society. Also plaguing the civilization were a series of floods and earthquakes. The abandonment of the cities began around 1700 B.C.E., and the civilization collapsed within 200 years, by 1500 B.C.E. Chinese history records a cultural change under the leadership of three legendary persons around 2800–2600 B.C.E. Fu His gave China hunting, fishing, trapping, and most importantly, writing. They got agriculture and trade from Shen Nung. And government and Taoism came from the Yellow Emperor (circa 2700 B.C.E.). After that, the Chinese enjoyed enlightened rule by the three Sage Kings: Yao (around 2350 B.C.E. ), Shun (around 2250 B.C.E. ), and Yu (rule began in 2205 B.C.E.). After this, history being cyclic, from perfect wisdom and virtue the course of human events decayed. China’s early agricultural civilization arose under the Xia dynasty near the southern bend of the Huang (Yellow) River, which has its source in Tibet. Chinese agriculture began near the southern bend of the Yellow River approximately 4000 B.C.E. Initially the agriculturalists grew millet, but later they began growing rice near the Huai River to the south. Neolithic societies arose after 5000 B.C.E. This was a stone-tool culture, tribal with some domestic animals but relying on hunting also. Some made fine pottery and bone tools. Presumably they engaged in intertribal wars and worshiped ancestors in some fashion. Neolithic China was a time of female rule, but the creation of complex large city-states resulted in a switch to a patriarchal society. The Huang River is yellow because it contains suspended fine loess. It is “China’s Sorrow.” Like the other nutrient-rich rivers, it floods periodically, bringing devastation. As people concentrated together, the need arose for authority to preserve order, settle disputes, and create public works. The Xia dynasty was the first effort to do this. Established in 2200 B.C.E. by Yu, it set the precedent for rule by a hereditary king. It also established flood control and political institutions. The central authority controlled the village leaders. It also emphasized metallurgy and the founding of additional cities as the population spread. The early dynasties ruled through family and kinship groups. Worship of ancestors was integral. The belief was that the ancestors remained present and able to influence worldly affairs. The dead were buried with material goods, and the head of the family presided over the rites. Socially, the culture was stratified, with the royal family and nobility on top. Hereditary aristocrats had large holdings of land. Artisans and craftsmen were a small percentage of society, and some worked only for the ruling class. Merchants and traders went south and west, seeking jade from central Asia or military technology from Mesopotamia. The peasant class served in the military or worked the land or provided general labor for the ruling class. In return they received land to work. They lived underground. Women made wine, wove, and cultivated silkworms. Slaves performed the hardest labor; they were generally prisoners of war. Chinese culture was secular. There was no organized religion. Fortune-tellers used oracle bones to predict the future. Early Chinese writing was in pictographs. It developed to ideographs to handle complexity and abstraction. It had over 2,000 characters but no alphabet or phonetic element.